Planning a group vacation can be a tedious activity, but my step by step guide will save big bucks and create an event you and your friends will be talking about for years to come. Figuring out every detail takes organizational skills as well as patience. That is one of the main reasons why people seek help in organizing group vacations. Travel agents do a great job of planning the logistics of a trip. 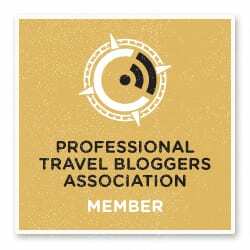 However, if you are like me, you like to save money where you can which is why I love planning my own group travel. Group travel vacations is a concept that will help save money and make your friends/family happy. The general idea is to plan a vacation for a larger group to achieve discounts. In a sense, you are acting as the travel agent for your group. In this article, I will outline some helpful tips you can utilize to obtain some amazing discounts. 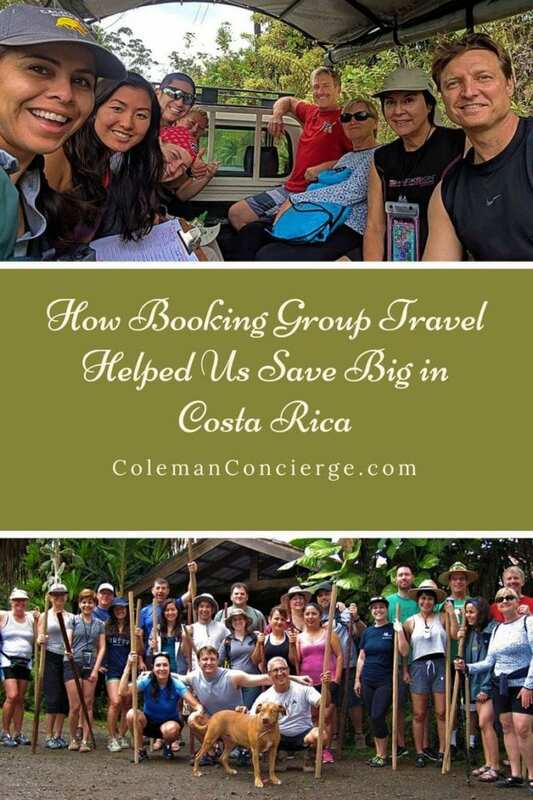 I was able to plan an all-inclucisive adventure trip to Costa Rica for 24 people for about half off using these group travel principles! Before you can start planning, you need to have an idea of who is in your group. Your group might consist of family members, friends or even co-workers. 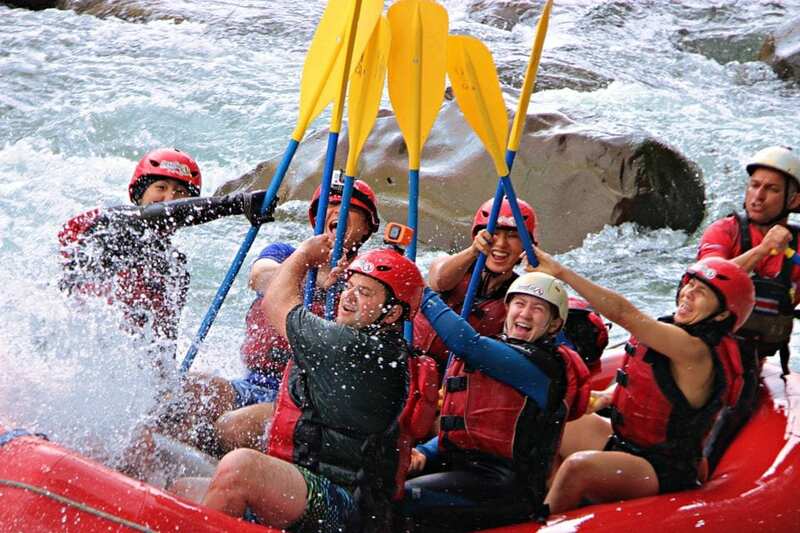 Personally, I like to invite anyone that will add to the positive group experience and in our case, is into adventure! Keep in mind that since you are dealing with a group, it is very important that everyone gets along, so be mindful of this during the invite process. Everyone should have fun and not interfere with anyone else’s fun. 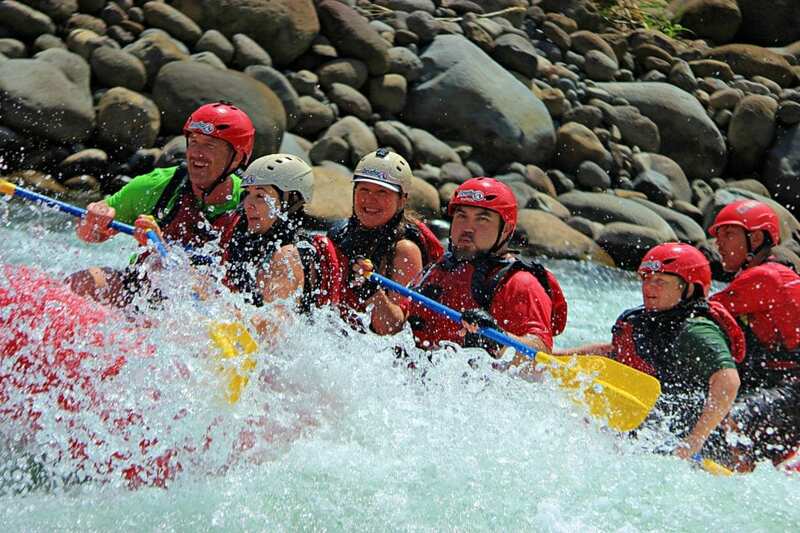 I find it fun to bring people together with very different backgrounds on adventure tours. 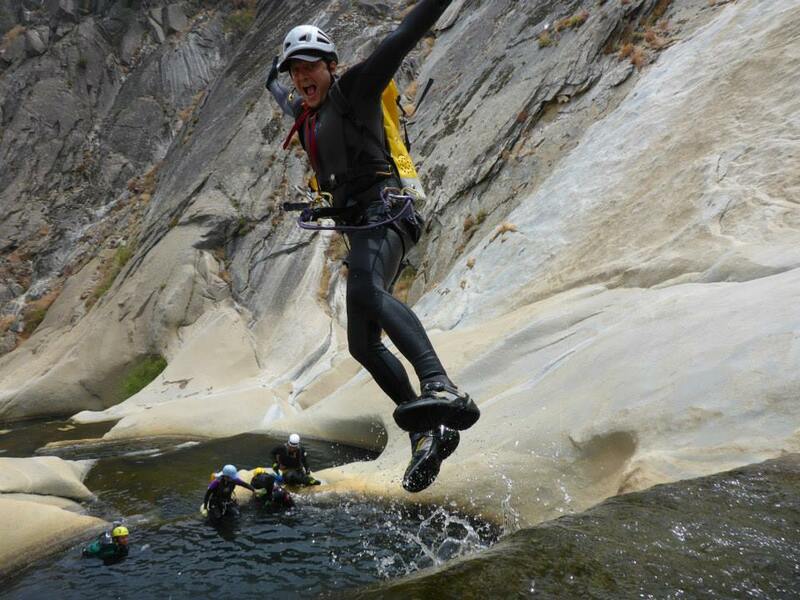 Some people in our group were experienced cavers and canyoneers. Others had never ziplined or been river rafting at all. It was great to see how everyone came together to help each other to overcome their fears. Since I was planning the trip, I themed the trip around adventure travel. Before you plan a trip, you first need to choose a destination. This part is trickier than it sounds. The problem is you are dealing with a group that may have wildly different ideas on what makes a great vacation. This goes hand in hand with selecting a central theme from the previous step. For this trip, we had chosen adventure travel. 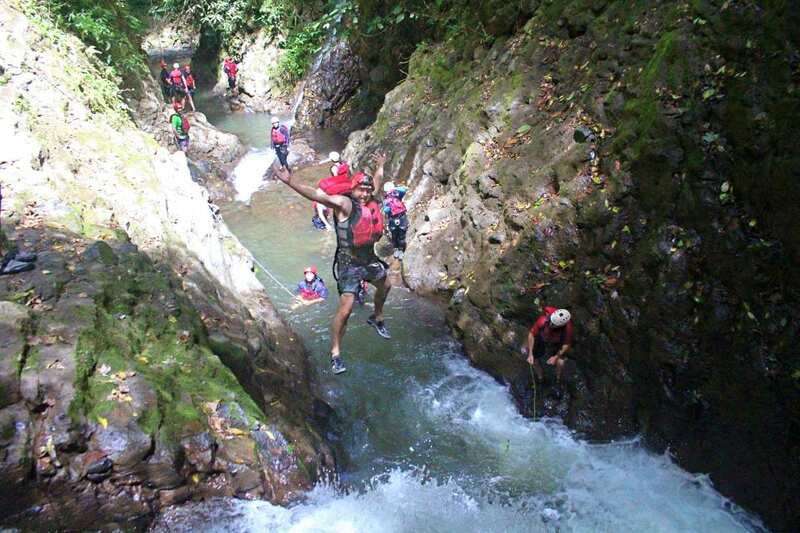 Adventures might include river rafting, caving, rappelling waterfalls, hiking, zip lining, etc. 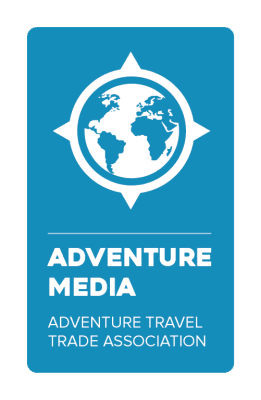 I started out Googling adventure tours and narrowed the focus down to a number of places. 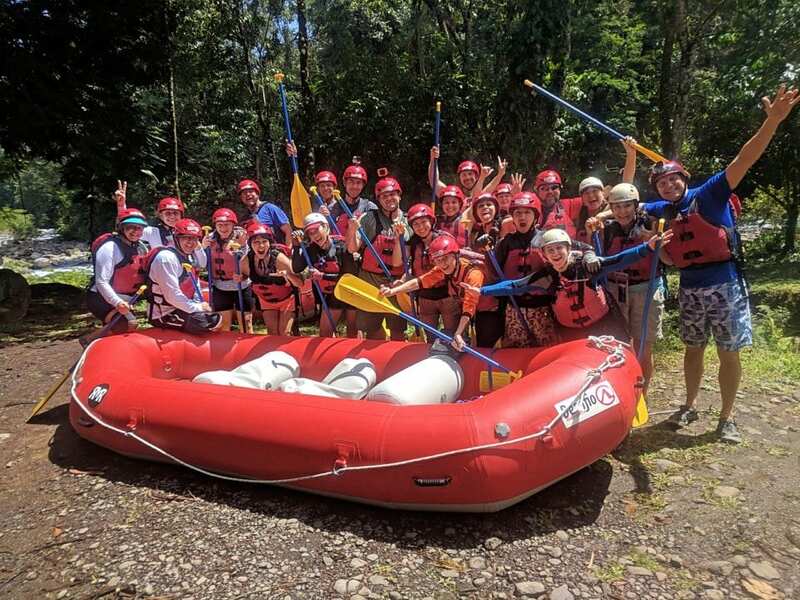 Costa Rica had most of the adventure tours we were interested in so we decided to include that as the destination for our group to further gauge interest. After making the basic itinerary, I created a Facebook event and floated the itinerary to the friends we invited while selecting a group. 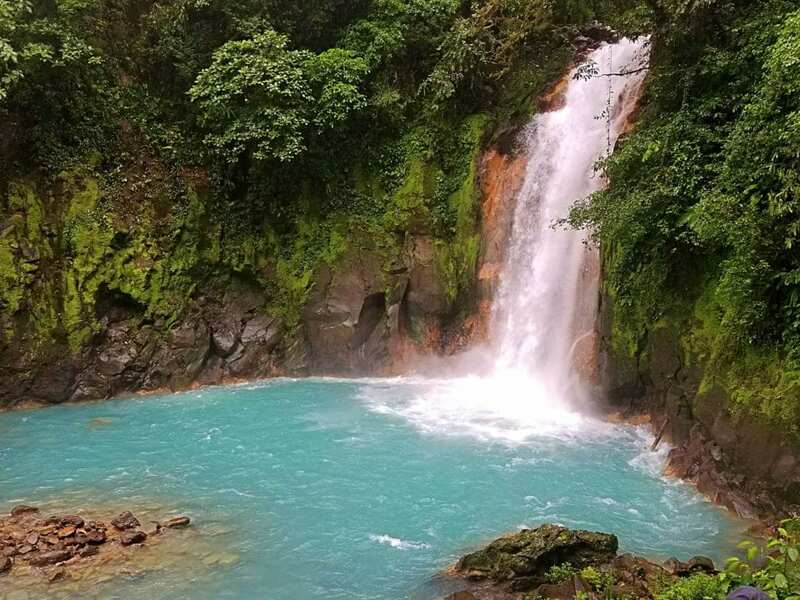 We had a very positive response, so we decided on an Adventure Trip to Costa Rica for a little Pura Vida. 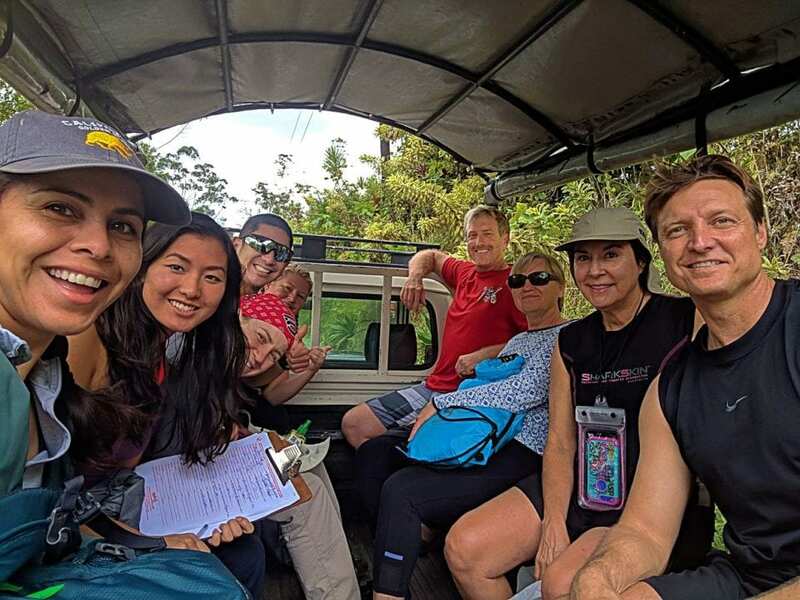 We then further narrowed our destination to Arenal as we found it to be a good match for the activities we were interested in based on the discussions in our group. Facebook is a great free tool to use to plan a group travel trip. You can create an event, communicate with everyone in the group at once. You can also selectively invite people and determine who is going (or not) at any time. Collecting money can be the trickiest part of trip planning. Between personal hangups and simple logistics there are any number of pitfalls. Hopefully, your group composition and destination selection has everybody agreeing on the price point so all that’s left are the mechanics of money transfer. You want something that’s easy and leaves a good paper trail, which has me turning to electronic applications. There are a number of apps you can use to split travel expenses; CostSplit, Split Wise and SettleUp just to name a few. Personally, I keep a spreadsheet of the costs and have people Paypal me. I add a new post to the Facebook event each time a payment is due. It’s a lot easier to plan trips in the digital age. TIP: If you use Paypal, make sure they transfer money as “friends and family” to avoid the fee! Clear, concise, and consistent communication is critical to keep everybody on the same page, especially when money is concerned. I strive to clearly show all the costs up front so people have a good understanding of the total cost of the trip. I also pad the total amount a bit to account for late cancellations and minor deviations. It’s easier to give money back than collect it in the first place. Tipping is another money concern that should be addressed up front. When planning these trips, you get to know the local providers well and it’s important to take care of them. The company can offer you a discount but, just like tipping at a restaurant, you tip of the full amount. Instead of chasing people around with nuisance amounts, you just collect the money up front and let everybody enjoy the trip. You’ll notice for large groups at restaurants, the tip is usually included on the bill so collecting tip money up front shouldn’t be a surprise to anybody. 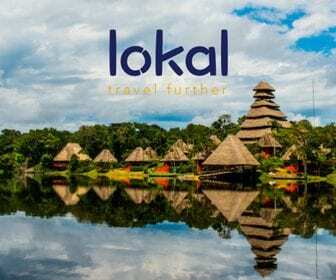 Finally, you should post a refund policy to avoid people asking for refunds close to the trip date as the lodge and/or company might not refund the full amount. This is all part of clear communications. I have found people to be reasonable as long as they know what is happening. Besides, if money is really going to be an issue the can decide upfront that your trip isn’t for them and you can bring in a person who really wants to be there. 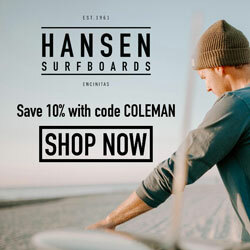 Here is where you can achieve another discount! Since we booked everything through one company, we asked for a group discount. We ended up doing 7 different tours over 5 days for 24 people. 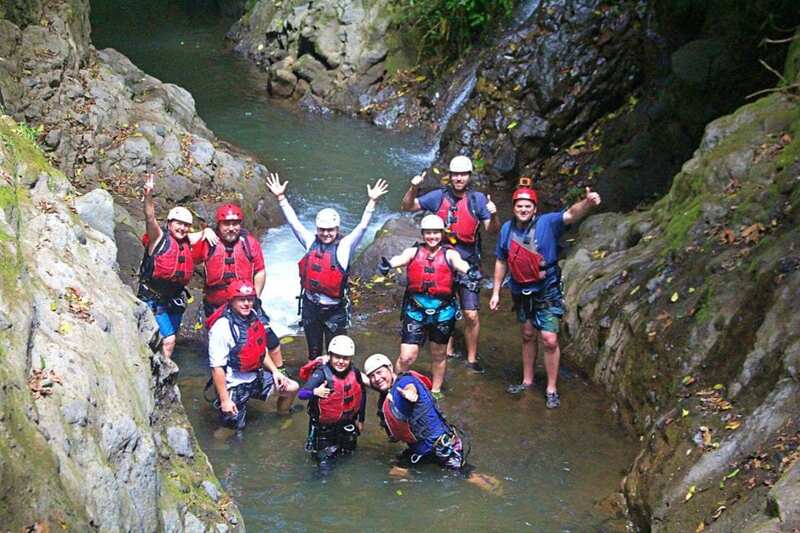 The company offered us between 20-30% off each trip based on our group size! Since our trip was based on active adventures, this ended up saving us $200-300 dollars a person. Perhaps, even more than the money was the special service Desifino provided to our group. The started by assigning us personal liaison to handle all of our questions and transactions. Our interactions verified that the company was able to handle the tour logistics for a large group. This included negotiating pickup locations and some tricking planning to fit multiple trips into the same day. They also offered refunds if people canceled ahead of time. The entire booking experience was professional and friendly. 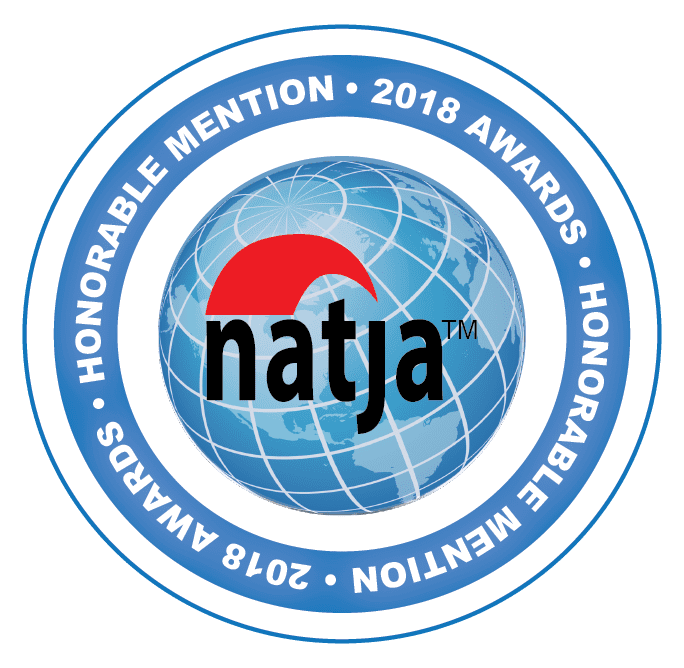 We got a lot of personal attention bringing a group this big on tours, but reading the Tripadvisor reviews, it seems like the company strives on provided quality service to every client, regardless of the group size. Read both the good and bad reviews. Keep in mind that not everyone’s review will be fair, but you can get a good general view of what to expect. 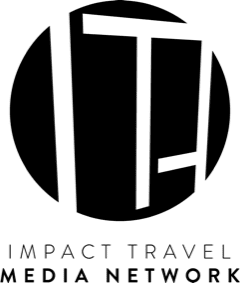 TIP: Always check Tripsdvisor (or similar site) when you work with a lodge or tour company. The most important rule for saving money with airfare is to be flexible with your booking dates and even airports so can shop for a great deal. There are good deals to be found of flights, but only if you can get your group organized. This is where interpersonal dynamics and good communication is key. A simple approach for group travel discounts is to contact the “group sales” department for an airline. Most airlines have a group sales contact that can quote prices below what you will find online. Call the airline on the phone and ask if you can contact their group sales department. This can often times lead to a steep discount. Like many groups, we were all located in about the same region with similar work schedules. The group appreciated my savvy shopping skills and I was able to find some great flights that saved everybody money. What’s more, since most of us were taking the same flight, it made logistics that much easier once we landed. 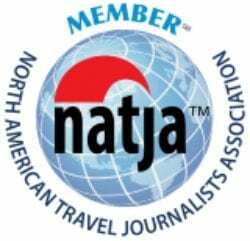 If you live near southern California and are interested in traveling to central or South America, one great way to save money is to leave out of the Tijuana airport (TIJ). Google flights is still a great option for saving money though, even outside of Southern California. I use Skyscanner or Google Flights to look for airfare deals whenever I travel. It is hooked into all the carriers that leave out of Tijuana. 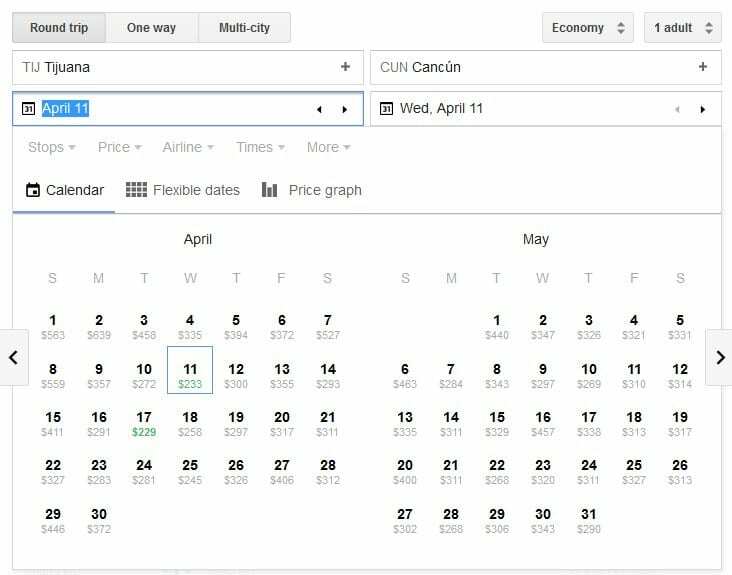 I like the month calendar view which shows you the day to day price for an entire month so you can pick the best times to travel. Leaving out of Tijuana instead of the states dramatically cuts the price of the airfare. 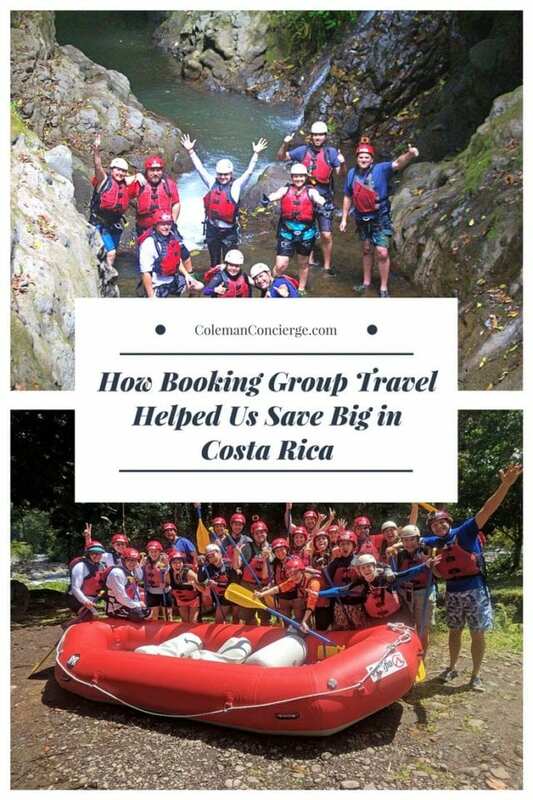 In fact, for our group of 20 people, the average round trip price from TIJ to SJO (San Jose, Costa Rica) was $340! That represents a huge savings over leaving out of San Diego or Los Angeles. In example is listed below. If you notice, the round-trip price from Tijuana to Cancun is as low as $223! Try to get that price leaving from the U.S.
A great tip for the Tijuana airport is that you can park on the U.S. side, and simply walk across the covered bridge to the airport. You won’t even realize you crossed the border. You only need to pay a $30 round trip price to use the CBX bridge. There isn’t even a line at the border to get back. You just walk back to your car and start driving home. Even though some of this advice is only applicable to the 24 million people who live in Southern California, the principles can be applied anywhere. The trick is to find a house or lodge that can accommodate a large group. 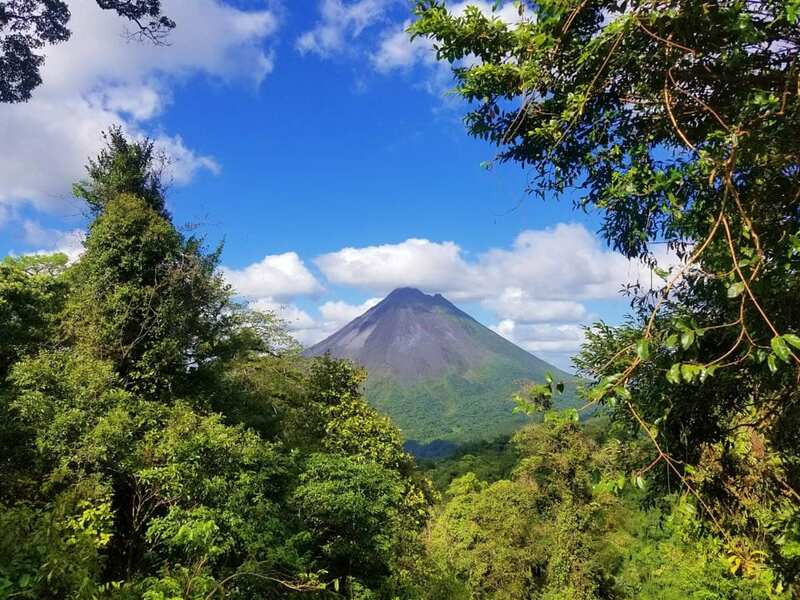 I did searches on both sites and entered a group size of 20 people with a destination of Arenal, Costa Rica. 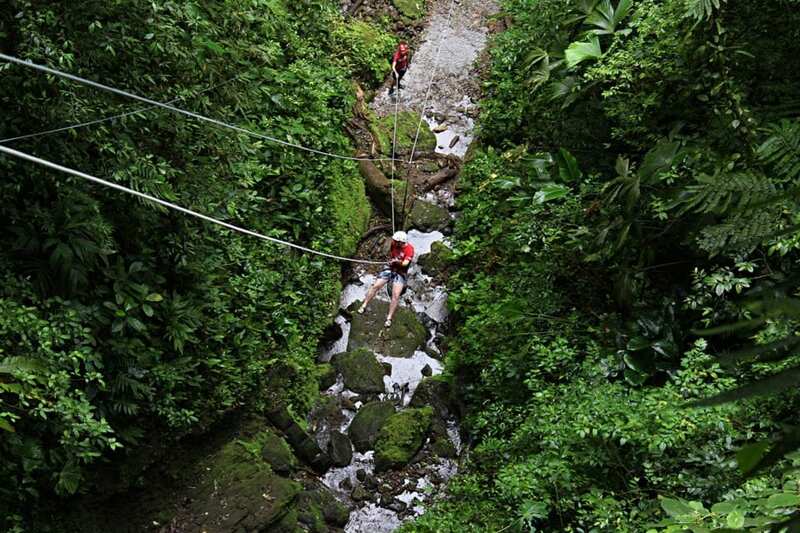 Then I narrowed it down to Arenal because that is where the most adventurous tours are. 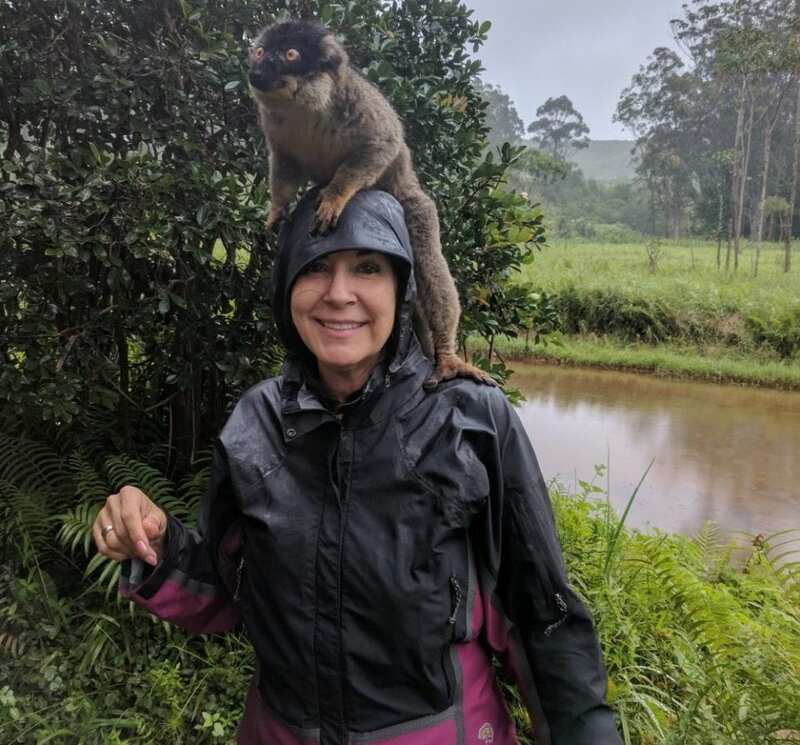 I found an incredible eco-lodge in the rainforest near the volcano. 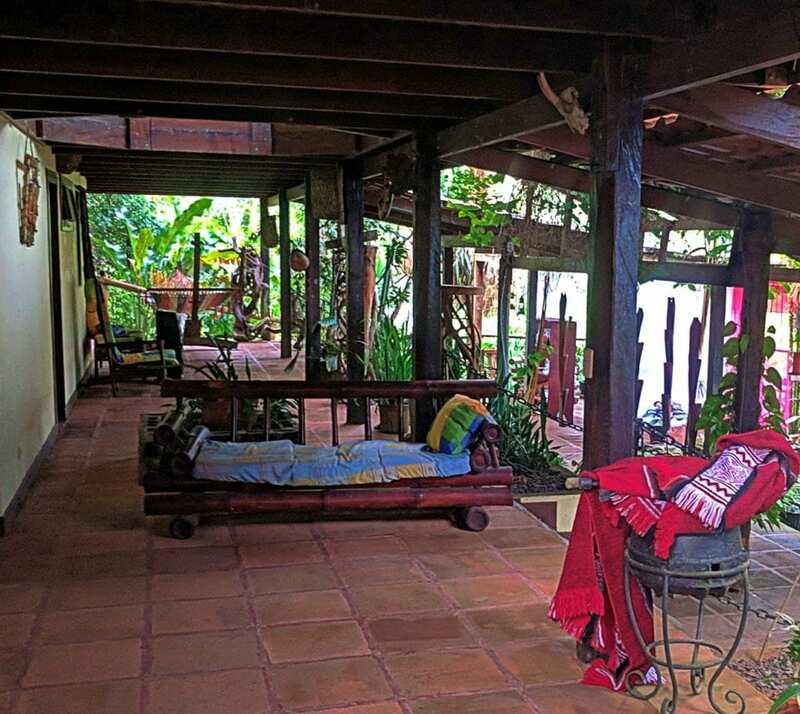 The AirBnB search result for the lodge stated we could rent out the entire lodge for a fixed price. Keep in mind too that this too can be negotiable. Our total group size ended up being 24 people, so this was a great option. Also, remember that ultimately you need to take the final group size into account. For example, our bus could only transport up to 24 people so that became a limiting factor. It also represented a huge savings…approx. 1/9th the price per person if they would have booked individually. We got more than just a hotel room. 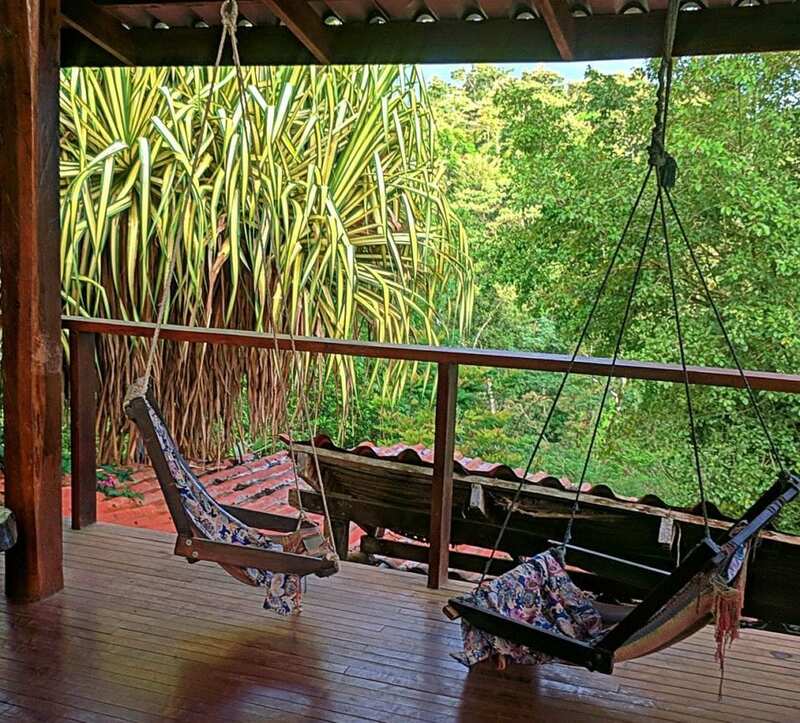 It was an eco-lodge in the rainforest on 24 acres. 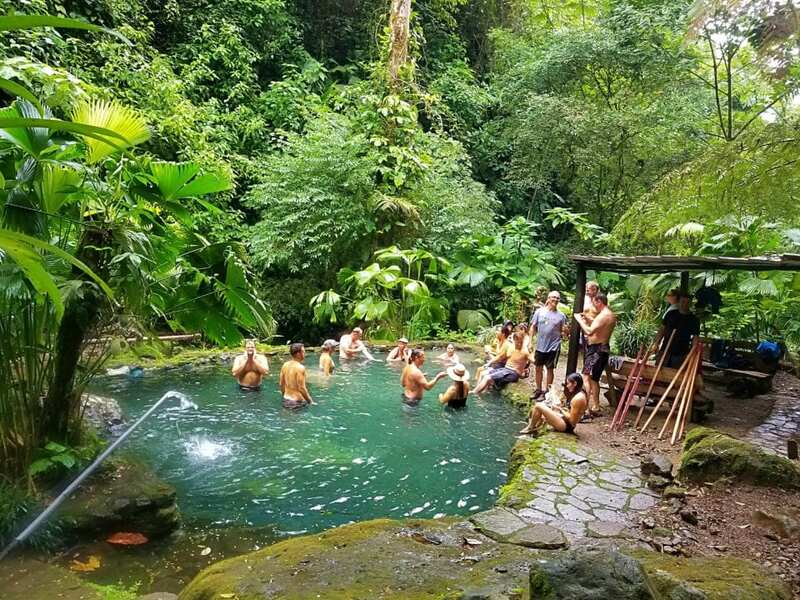 The property included waterfalls, natural spring pools, and even a natural mud bath. Not only was I able to save everyone a good deal of money, I was able to provide an amazing setting. Our meals were prepared by private personal chefs every day. The discounted group price was for food was $7 for breakfast and $15 for dinner per person. 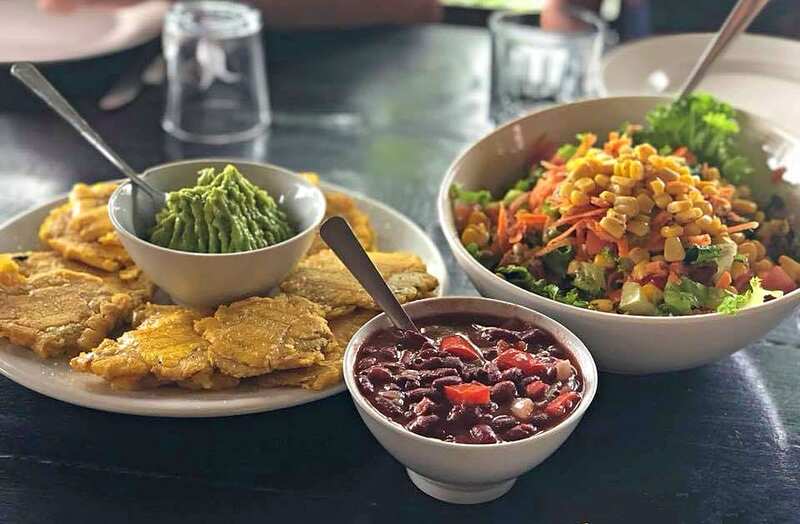 Our food was authentic Costa Rican cuisine and it was fantastic. 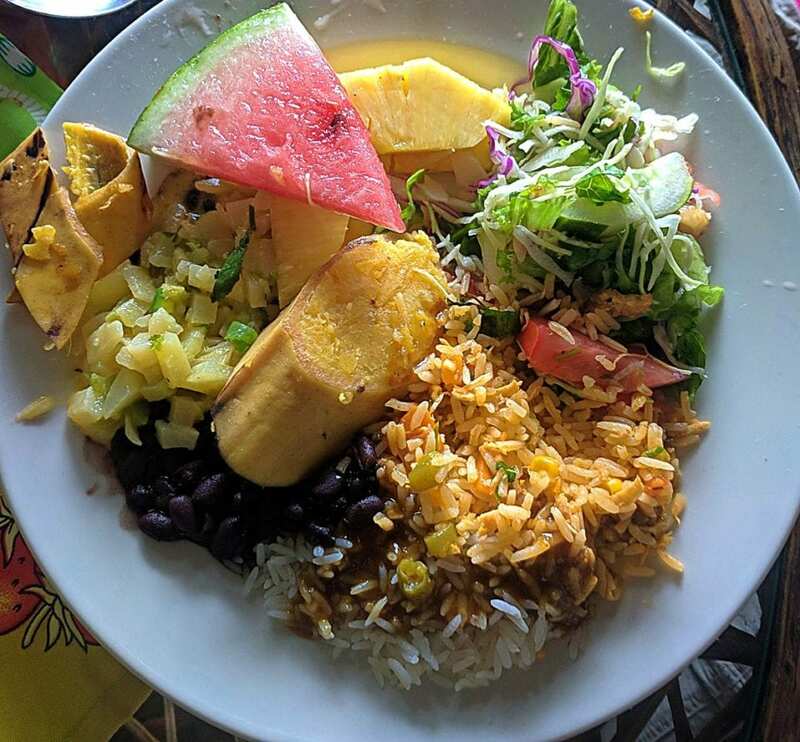 The Lodge had the best Costa Rican food we ate in country! 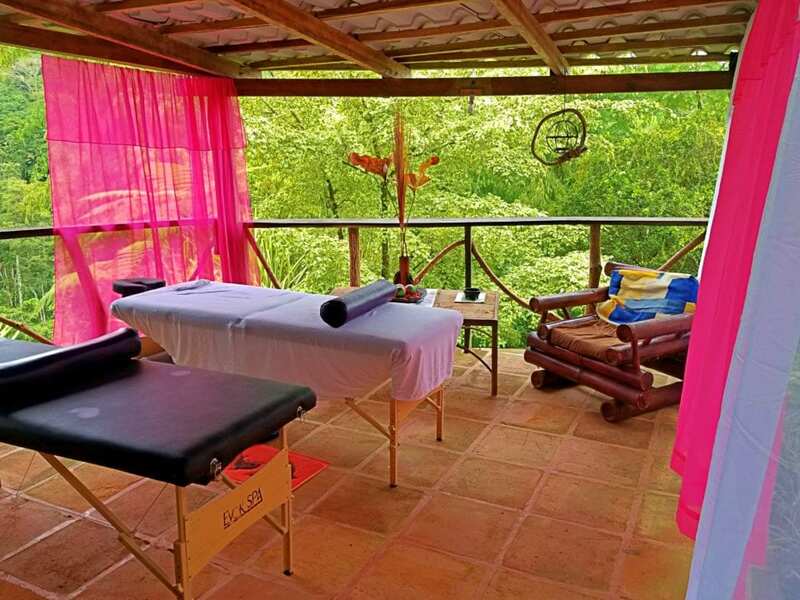 Princesa de la Luna Lodge also offered $25 per hour massage based on our group size. 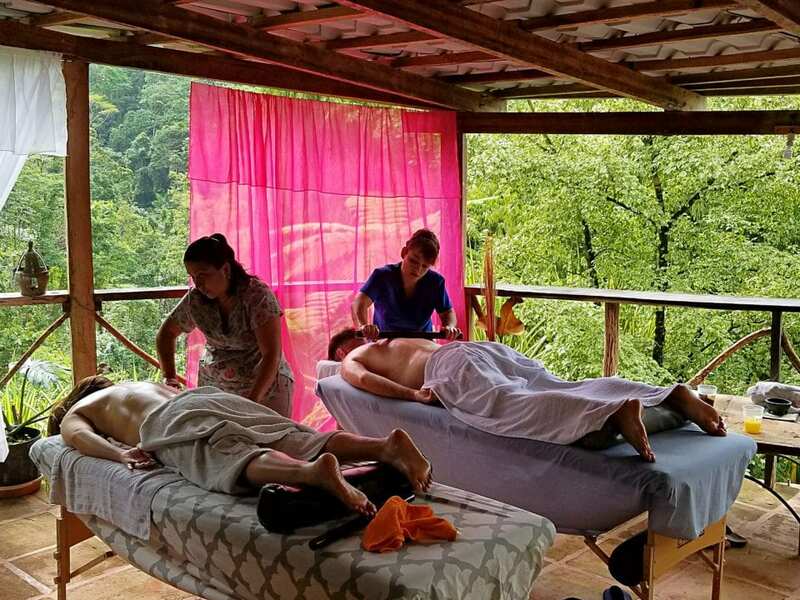 The massages were a huge hit with our group. Eating together as a group was a really nice touch. People would share with others the amazing adventures they had every night. Nothing brings people together better than food! Keep in mind that your accommodations will depend on your group size. If you are planning for a smaller group, a house is a great option. You can split the cost between people and end up staying in a much nicer and more private place. Normally when on vacation, transportation can be expensive. 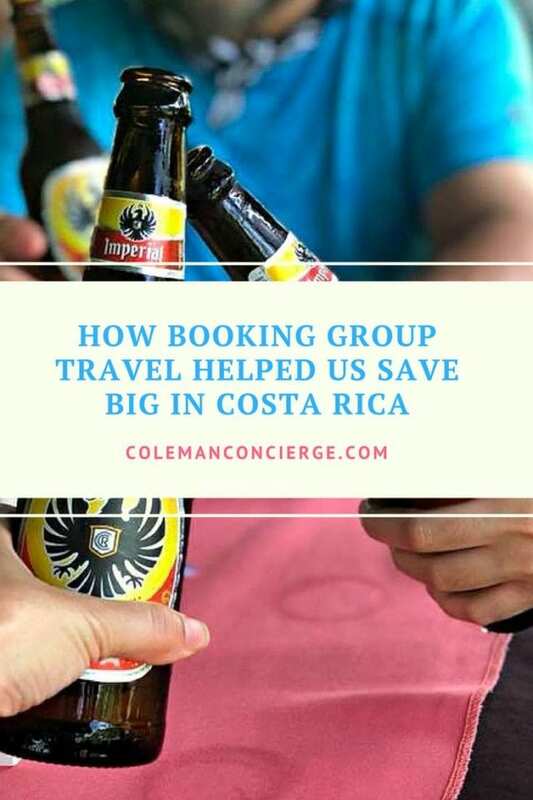 As an example, to transport a person from San Jose to Arenal in Costa Rica generally costs $150 each way. That is $300 just to go to and from the airport! The trick here is to do group transportation. We had the lodge arrange for a bus that could transport all 24 of us for $400 each way or $800 round trip. That breaks down to only $33 a person round trip! That’s almost 1/10th the cost if they were to arrange it on their own. In general, most tour companies can arrange for group transportation, or you can find companies that specialize in this online. For our group, it was convenient to have the lodge arrange this for us and they gave us the best rate. Overall, the trip was a huge success. Everyone had an amazing time and I was able to put the following trip together for an extremely low price. One great thing about group travel is that everyone gets to share their experiences with each other. This includes the tours as well as the meals. It really helps to bring people together. Group Travel is not easy. It involves a lot of work, but ultimately, you are saving your friends/family money and bringing them happiness. Personally, I can think of no greater reward.